Martin Keith basses are built to order. As a result, each bass is a unique combination of features and specifications custom-tailored to the needs of the client. This page describes some of the most meaningful details found on my instruments. Whether an instrument is acoustic or electric, its sound and response will always be a function of the materials used to build it. After nearly 20 years of building, I have developed an understanding of how materials selection can shape the sound, look, and personality of an instrument. 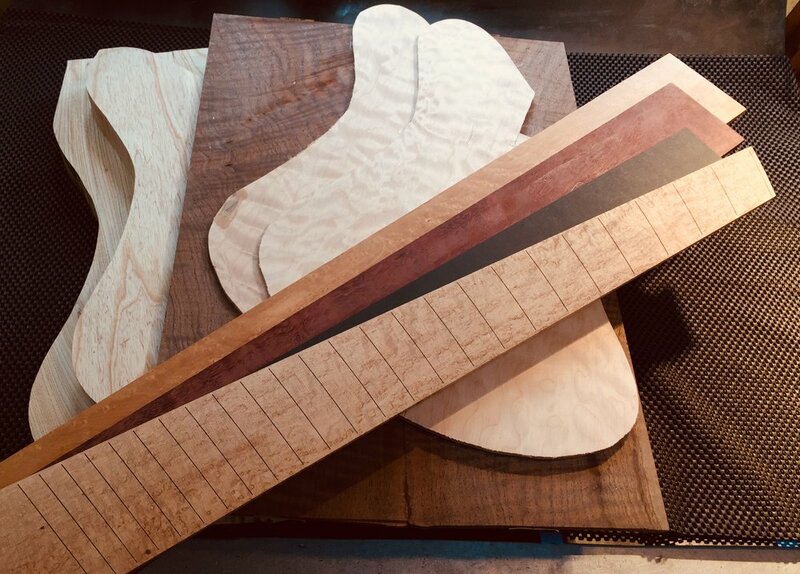 I work with each client to chose a set of materials (body wood, neck wood, fingerboard) that will work together to deliver the desired sound and character. I strongly believe that every instrument is “acoustic”, and that while pickups and electronics serve to amplify the native, acoustic sound of the instrument, it is the wood and construction that create it. Each Martin Keith bass neck is carved by hand using rasps, files, planes, scrapers, and sanding blocks. Although it would be faster to use machine-powered carving tools, I feel that the hand carving process results in a neck which is friendly and welcoming to the human hand. This carving process is still one of the most enjoyable parts of building each instrument, as it lets me step into the role of the player and imagine the experience of playing the finished instrument for the first time. The zero fret is a standard feature on all Martin Keith basses. This simple feature improves intonation by maintaining perfect alignment between the open string height and the fret plane. By allowing the strings to ring from the same material in both open and fretted positions, the zero fret also contributes to a more even and uniform-sounding instrument.